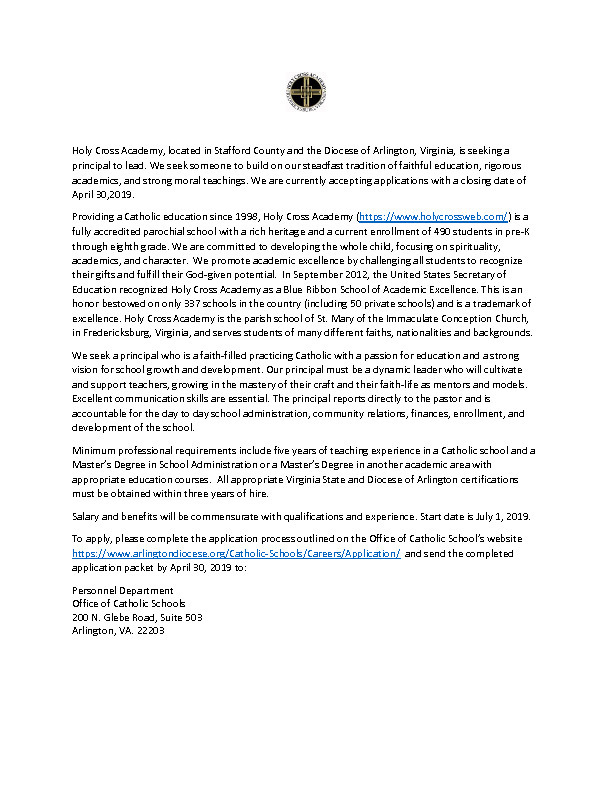 Holy Cross Academy, located in Stafford County and the Diocese of Arlington, Virginia, is seeking a principal to lead. We seek someone to build on our steadfast tradition of faithful education, rigorous academics, and strong moral teachings. We are currently accepting applications with a closing date of April 30, 2019. Providing a Catholic education since 1998, Holy Cross Academy (https://www.holycrossweb.com/) is a fully accredited parochial school with a rich heritage and a current enrollment of 490 students in pre-K through eighth grade. We are committed to developing the whole child, focusing on spirituality, academics, and character. We promote academic excellence by challenging all students to recognize their gifts and fulfill their God-given potential. In September 2012, the United States Secretary of Education recognized Holy Cross Academy as a Blue Ribbon School of Academic Excellence. This is an honor bestowed on only 337 schools in the country (including 50 private schools) and is a trademark of excellence. Holy Cross Academy is the parish school of St. Mary of the Immaculate Conception Church, in Fredericksburg, Virginia, and serves students of many different faiths, nationalities and backgrounds. 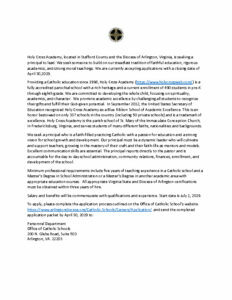 We seek a principal who is a faith-filled practicing Catholic with a passion for education and a strong vision for school growth and development. Our principal must be a dynamic leader who will cultivate and support teachers, growing in the mastery of their craft and their faith-life as mentors and models. Excellent communication skills are essential. The principal reports directly to the pastor and is accountable for the day to day school administration, community relations, finances, enrollment, and development of the school. Minimum professional requirements include five years of teaching experience in a Catholic school and aMaster’s Degree in School Administration or a Master’s Degree in another academic area with appropriate education courses. All appropriate Virginia State and Diocese of Arlington certifications must be obtained within three years of hire. Salary and benefits will be commensurate with qualifications and experience. Start date is July 1, 2019.